Blast off to a space-age adventure with Stars Mega Spin and see if you can teleport a Mega Progressive Jackpot into your account. Every bet increases the size of the Progressive Jackpot, which is guaranteed to make the winner an instant millionaire! Stars Mega Spin is a Slot that takes you into the furthest reaches of the mysterious cosmos, among the celestial beauty of the planets and stars. A galaxy-sized slice of fun, only the bravest and boldest starfighter pilots will have the opportunity to bag the biggest prizes – but anyone can have a great time in this sci-fi Slots extravaganza. Join us on our intergalactic journey through time and space at PokerStars Casino. As you enter the game, you'll see a solitary star, shining its radiation out into the rest of the cold galaxy. You're surrounded by asteroids, so be sure to navigate carefully and you might just be okay. 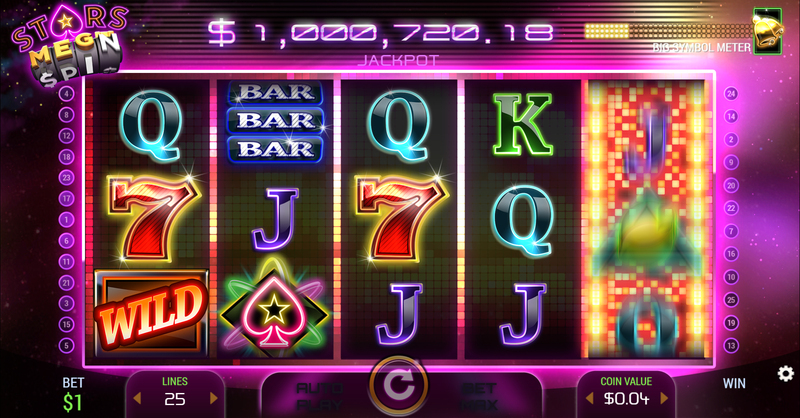 As you sail through the stars of this five-reel, 25-payline game, you will be able to explore a cosmos that, aesthetically, has as much in common with disco music videos as it does with space operas – even without considering the futuristic, upbeat electronic music accompanying your play. Of course, you're burning like a supernova to ask one big question: how do you win the Mega Progressive Jackpot? 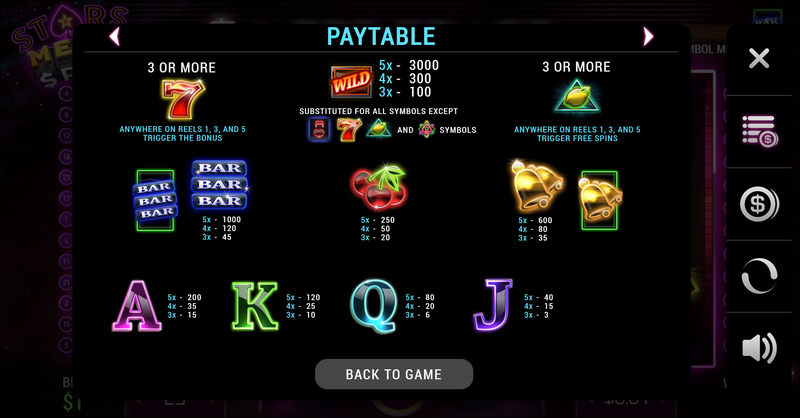 Simple: the Progressive Jackpot is yours when five Stars Mega Spin symbols appear anywhere on the reels. All 25 paylines are automatically played and all bets, even minimum bets, qualify to win the Jackpot – so you don't need to be a high roller to have a shot at becoming a millionaire! Please see the ‘Jackpot Details & Rules’ section below for more detailed information regarding the Slot’s Jackpot feature(s). 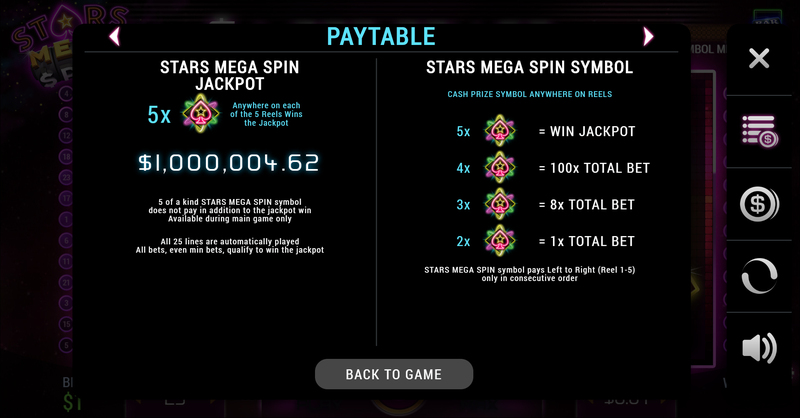 First and foremost, Stars Mega Spin comes with a Free Games feature. Whenever three Lemon scatters appear on reels one, three and five, you’ll trigger the bonus – this can give you anything between three and seven free games. During this bonus, you should keep an eye out for the random wild feature that occurs only during free games. On every single spin of the feature, between one to five extra wilds can appear on the reels and instantly boost your chances of a winning combination. You can expect to find plenty more bonus features on your spacefaring adventures. The 7s Bonus is triggered whenever you land three 7s Bonus symbols on reels one, three and five. However, before you get right into it you will have a decision to make. Your choice will depend on your Slots experience and on how confident and lucky you feel. You'll be prompted to select the level of risk you’re happy with, ranging from Low to Medium to High Risk. This will dramatically alter what you can win, with the potential prize being higher for each level of risk – but the chances of a smaller win increasing as the maximum prize goes up. Each risk mode awards up to ten picks with different multipliers: Low earns up to 10x, Medium earns up to 30x, and High earns you up to 500x per pick. Then, it's time to reveal the prize. The Card Bonus is played when an ace card symbol appears in the centre reel position. After that, you’ll then be prompted to pick two cards which will form a poker hand. If you win the poker hand, then you'll get an instant cash prize. And last, but definitely not least, there’s the Big Symbol feature – just to make sure things don't get boring! Every 35 spins, the 3 Bar or Bell symbols will double in size on the reels and increase the chances of a multi-line win. The Big Symbol feature can only be activated during the main game, with that feature, if triggered, lasting for five rounds. Spins with the Big Symbol feature activated do not count towards the triggering the next Big Symbol feature. Big Symbol feature spins are played at the same coin denomination as the triggering spin. The Mega Progressive Jackpot begins at £1,000,000 and continues to increase with each bet until it is won. The RTP is 96.57% and 2.2% of every player's bet contributes towards the Progressive Jackpot. Stars Mega Spin is one of the very latest generation of Casino Slots games, exclusively available at PokerStars Casino. PokerStars Casino has brought years of expertise in the world of iGaming to bear in this Slot. You'll need to navigate your spaceship through delicate situations aplenty, but it's well worth it for that Mega Progressive Jackpot.